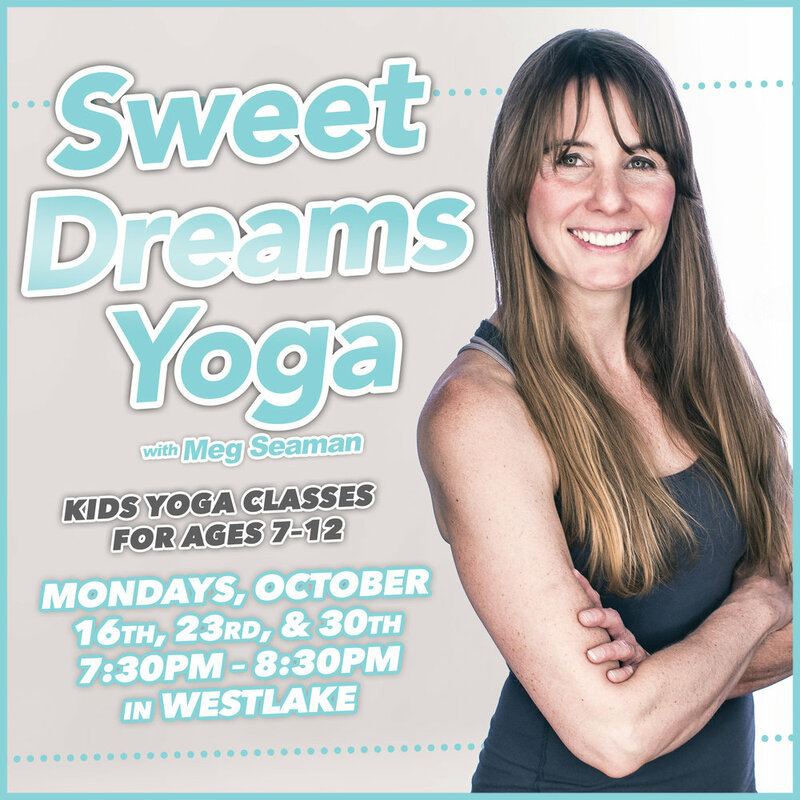 Join Kids Yoga Teacher, Megan Seaman, for Sweet Dreams Yoga in Westlake! Kids, come out with mom and dad on Monday nights for yoga to make your dreams the sweetest! While your parents are steaming up in their Hot Yoga Flow next door, we will be chillin’ out with smooth moves, cool breaths, and groovy tunes. Throw in a peaceful Zen pose, and you will be on your way to dreamland! So dreamy, your parents will be wishing they could join us. Kids Only! Kids bring to class your fall collections of leaves in colors red, yellow, orange, green, and brown! We’ll play with the colorful leaves as we move and breathe into a peaceful dream of fall and its changing of colors. Autumn is a time of harvest and a time when woodland animals come out to gather food for their long winter naps. Native American tribes’ folk stories tell of the special relationships animals of fall have with humans. Kids bring pictures of your favorite autumn animal (for example, squirrels, deer, groundhogs, turkeys, coyotes, rabbits, hawks, etc.) and we will see where they guide us in our yoga adventures, and prepare us for our winter naps. Oh, Halloween’s Eve! A time of excitement in waiting the day when goblins, ghosts, princesses, and superheroes come out to share a trick or treat! Kids come join us for some ghoulish yoga fun! Wear your Halloween Costume and prepare to trick even the most guileful of ghosts with your smooth yoga poses and haunting howls of breath! Bewitching treats await you and foretell the coming of the sweetest yoga dreams of Halloween! Cost is 14.00 per class or class pass. Sweet Dreams Yoga will be offered by Inner Bliss Yoga Studio’s kids' yoga teacher, Megan Seaman. Megan has been working with kids on their personal growth in her career as counselor that spans 20 years. She was certified through Marni Tasks’s Jivasara 200-hour yoga teacher training, and has been facilitating the mindful and heart-opening practices of yoga and meditation for children and adults since 2012. Megan has her PhD in counseling with a specialization in children and families. She aims to encourage kids to have fun and open their hearts, while learning about themselves and their worlds. Besides teaching kids in the Inner Bliss Yoga community, she works as a mental health therapist in a private practice, and she is an assistant professor of counseling at a local college.